a nutshell, you could quote Botho Strauß who describes the process of writing as the persistent attempt “to re-invent memory” (1), a process of writing forth and forth into the past. Michael Wendt´s photographies, too, deal with memory. You can even say that his work declines a grammar of memory. Yet, how does memory work? You cannot control it, as it surprises us with images and impressions. Memory is not something you can plan, it is out of our conscious reach. Neuroscience differs between three kinds of memory: The episodic memory – the one meant here – is the only one that brings back the past into the present. The brain enables his with so called place cells which are important in spatial orientation. These place cells produce a signal for past, present and future. Or, if you put it differently: the neurons connect a present content (i.e. the place where you are right now) with a past or a future content (a place you have been before or a place you will be). The other two kinds of memory – the semantic memory and the procedural memory – do not enable such mental leaps in time. The time travel is connected to the unique quality of >Thinking-yourself-back<. By remembering the sensual aspects of the experience return to us (the smell of colour, the flickering flames). The way you felt, what you were thinking and how you judged the situation – all of this becomes present in your mind again while remembering. (2) Yet, how does memory work? You cannot control it, as it surprises us with images and impressions. Memory is not something you can plan, it is out of our conscious reach. Neuroscience differs between three kinds of memory: The episodic memory – the one meant here – is the only one that brings back the past into the present. The brain enables his with so called place cells which are important in spatial orientation. These place cells produce a signal for past, present and future. Or, if you put it differently: the neurons connect a present content (i.e. the place where you are right now) with a past or a future content (a place you have been before or a place you will be). The other two kinds of memory – the semantic memory and the procedural memory – do not enable such mental leaps in time. Michael Wendt undermines the deceiving connection between memory and the alleged photographic objectivity. Taking pictures from old family albums and postcards from his journeys and shooting them again, there are only little hints left to the former material. The photographies taken from old family albums awaken the time in which they were taken. Therefore they can be regarded as a phase in his work. »Rome, 1962« is the title of one of his pictures. The female in the front and the gate in the background are both blurred. It seems as if the woman was accidently walking into the picture. The fuzziness gives a dynamic to the person that is transferred on the architecture. The focus of attention is the young man who like a silent observer is standing still. The documentary character is given up here and there is also no sign of a biographical aspect of Michael Wendt´s famliy album in it. Moreover the urban life style of the city is emphasized, the same life style that is conveyed in many unforgettable films from this decade. The diffuse fuzziness is achieved by the use of a single lens reflex camera with a special optic. The lenses of the objectives have been rearranged by the artist. In addition to that he moves the camera during exposure and puts points of light with the photo lamp. 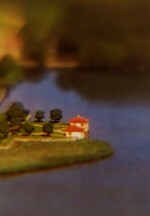 The result: blurred pictures, interrupted by single sharp zones which suggest a film effect – you can actually compare the method with a dynamic camera zoom. shows a group of three persons in dynamic movement. They are frontally illuminated, they almost seem to radiate and interact in a way that is left open to speculation. The three figures are centrally posed in the middle of the picture. Yet their gestures of turning bind them to the left fringe (where they come from) and to the right fringe (where they are heading to). Past, present and future seem connected to each other. The three persons seem to be lost in a conversation, not feeling observed. The observer feels the wind and the warm sun on their faces and also the haste they are in. The picture does not only show an instant in an episode. Moreover, a complex coherence of experiences is activated. Michael Wendt creates photographies with the adventure quality of films or roaming memories: As if you were watching out of the window on a long train-journey.